I’ve posted previously about TextMate, a great text editor for Mac OSX. While it is one of the best text editors I’ve used due to its simplicity, elegance, and power, there are a few UI features that drive me up the wall, and make it fall short of being perfect. Here I have a bunch of text selected. What will happen when I hit tab? If you answered, delete your selection and insert a literal tab, you win the prize. What happens in Microsoft Word, NetBeans Platform, and any number of other IDEs and text editors? The text is indented. This is clearly the better alternative in my mind because it is non-destructive, and you can get the destructive tab with a simple addition of any delete/backspace key before hitting tab. To indent the region, you have to do ⌘-]; to unindent you do ⌘-[. I’m sure there’s a way to remap tab and shift tab to indent the region, but it’s not immediately clear to me how to do that. If you know how, please comment so people can see. Every time I switch between Netbeans and TextMate I invariably delete a whole region of text I meant to indent by forgetting to context switch and use ⌘-]. Fortunately TextMate has extremely good undo support, so it’s not the end of the world, but it’s that little bit of friction that slows down work and adds up to frustration over multiple instances. Here I want to move the block of text backward; I resist the urge to hit shift tab, and instead press ⌘-[. What happens? Not what you’d think. I really cannot think of a valid reason for this behavior; I have the first line selected, but it does not respond to the indentation command. Very frustrating. If you are working on an unsaved file, there is no way to tell TextMate to treat it as a file of a certain programming language, and thus which syntax highlighting rules apply. Why is this irksome? When I’m writing a blog post, for instance, I have a lot of snippets I compose in TextMate. In order to get the syntax highlighting to work correctly, I need to save each individual file. Now, I’m not suggesting TextMate is magical and can read my mind as to what ruleset to apply to an unsaved file. What I’m suggesting is the addition of a menu that allows you to apply the syntax rules of a given language to the current file, regardless of whether it’s saved or not. Notepad++, a Windows text editor, has precisely this feature. EDIT: Thanks to the comment by Marshall, I realize that this complaint is way off base – I didn’t realize where the menu was but it’s there. Right where it says “Plain text” in the above screen shot, click that and you get a full list of languages to treat the file as. Tab support is abysmal. There is no support for closing tabs with the middle mouse button, a convention followed by most major web browsers, as well as NetBeans and Eclipse. Instead, you are forced to click a small close icon on each tab. Fitts’s Law states that the smaller a button is, the longer it will take a user to navigate to; this is part of the reason that Apple has adopted menu bars at the top of the screen rather than floating with each window. Doing so gives the menu effectively infinite height, as the user can slam the mouse up and not go past it. Long story short, having the only means of closing tabs be a tiny button is bad UI design. When you right click a tab in TextMate, no context menu appears – there is absolutely no menu option I can find to close all tabs. Any system providing tabs should allow the user to make a blank slate for himself and focus on one (or zero) files at a time. As it stands, you must click each tiny x button individually on all the tabs. Finally, you cannot undock tabs. Again, maybe I’ve just been spoiled by other products like Adium, Firefox, and NetBeans, but I consider it a very important feature to be able to undock tabs to show two windows side by side. While tabs are certainly more space efficient than tiling windows side by side, sometimes you really need to compare two files side by side. TextMate makes it very difficult to do that, especially when you have opened a project rather than individual files. After the drop is completed, the tab is split off from the original window and becomes a separate frame. TextMate is an excellent text editor but not without some usability flaws. I’ve detailed some features that irritate me about TextMate, due to their violation of the principle of least astonishment; I’ve used enough other similar systems to expect certain functionality, and this expectation is violated in a few ways. These ways include the fact that hitting tab while text is selected replaces the contents with a literal tab rather than indenting the region, lack of a feature to syntax highlight unsaved files, an inability to close multiple tabs at once, and finally an inability to drag tabs out of the frame to become separate frames, so as to be able to compare documents side by side. Software designers take note – if you are going to have tabs, you must build in these features or your users will feel seriously limited. This has been all over Twitter, so I apologize if this isn’t new to you. I absolutely love the fact that this video had as a visual not a boring set of PowerPoint slides, but instead a beautifully illustrated backdrop that was both informative, clever, and funny (the BTTF reference made me laugh). This comes to a slightly different conclusion than that of The Cathedral & the Bazaar: Musings on Linux and Open Source by an Accidental Revolutionary , one of the more popular books explaining the open source movement. In that work, the author Eric Raymond puts a lot more emphasis on the importance of recognition as a motivating factor for open source; it’s not just the fact that you are contributing to a worthwhile cause, but the fact that your name is attached to the work. Obviously that book was written much earlier than this video was produced, but I wonder what the author would think of it. If your project builds fine but then crashes with a runtime exception when it hits a block of code, the problem is probably with the “Compile on save” option. 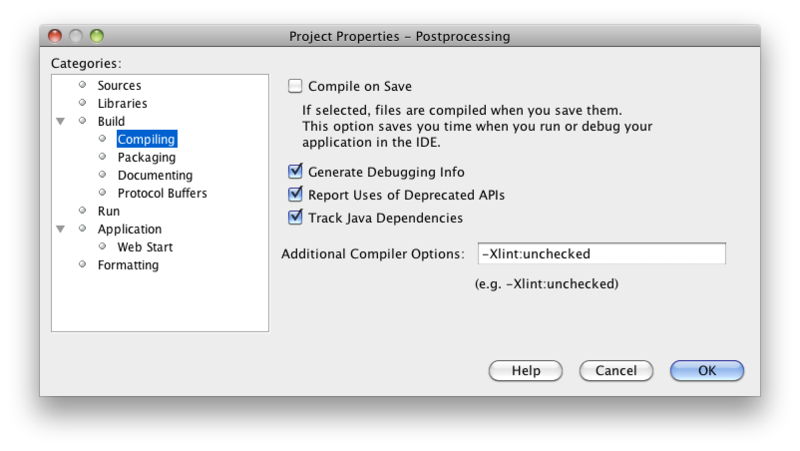 Right click on your project, choose Properties, Build -> Compiling. Uncheck Compile on Save. Manually build the project. When you re-run the code, the errors should go away. Not sure what causes this, but it’s immensely frustrating and seemingly non-deterministic. Wish I had a better solution than this, but I don’t. Somehow (not sure how) this directory can get corrupted or fail to update. If you close netbeans, delete $USER/.netbeans/var/cache/index and all subdirectories and restart netbeans this clears the cache. If you have no compile errors, your problem ought to go away at this point. NB: $USER is your user directory – on Windows 7 this is usually c:\Users\username, I guess on Unix it will be ~username. Thanks to Nick Fortescue for this information.